Nearly 40 years ago and from humble beginnings, Frank Golemme established his business. Through pride of ownership, strong relationships and an unwavering commitment to providing the very best stone products, Granite Worx is now one of the largest stone countertop providers in Alberta. We have fabrication facilities in Calgary and Edmonton servicing the entire province. This affords us economies of scale, unmatched product inventory and unparalleled experience. Five guiding principles that make us successful and have been carried forward: • Great Value • Outstanding Service • Timely Turnarounds • Superior Quality Products • Wide Variety of Color Choices Granite Worx will provide a level of quality, service and value that meets or exceeds our customers’ expectations. Every team member understands that it is a privilege to be involved in your project. We will do everything we can to ensure you are completely satisfied with the quality of our work and the level of service we provide. We look forward to working with you! All Stone Inc. is a family owned business specializing in natural stones like granite, marble, quartzite, slate, limestone and travertine. Established in 1998 by Wladek and Danuta Kwasniewski, Allstone’s mission was to “provide high-quality stone work at competitive prices.” At that time, Wladek’s 30+ years of stone experience, hard work and dedication allowed Allstone to succeed. Like many good family businesses, it captured the interest of the next generation. Rafal and Radek joined their parents shortly after the opening. They learned the trade from the bottom up; cutting, polishing, and installing. They each now hold 10+ years of experience in the industry; experience that has helped us modernize and adapt to an ever changing marketplace. By combining the precision of CNC technology with our dedication and craftsmanship, we are able to hold true to our mission statement today. We carry a wide array of products, from natural stone to engineered quartz, and we’re happy to show you everything in between to ensure your stone product is simply perfect. Bossio Stone Imports is a family business owned by Tony and Loretta Bossio. Over 30 years ago Tony, a journeyman tile setter, started a small business known as AB Tile & Stone Installations. Over the years, it grew into two companies, their son Santino became actively involved, and in 2009 AB Tile was joined by Bossio Stone Imports. During the summer of 2012, both locations came together under one roof in a newly renovated west Edmonton showroom. In addition to their own lines of porcelain and ceramic tile, they also have a wide selection of floor, wall and backsplash tile from several manufacturers – including slate, travertine, limestone, marble, glass, and granite tiles. Combined with their ability to offer quality granite, marble and quartz countertops, Bossio Stone can be your one stop shopping destination. Qualified, helpful Interior Designers are on staff and would be happy to help you coordinate your choices, offer design suggestions, and come up with solutions to fit your budget. Professional installation is available, or you’ll find both the products and advice you need to do it yourself. Many items are in stock and available for either pick up or delivery. Based in Edmonton, Reliable Granite specializes in designing and creating custom made stone works for architects, interior designers domestic and commercial projects and homeowners. We do all aspects of stonework including floors, walls, staircases, kitchens, baths and surrounds, vanity tops, fireplaces and unique designer pieces. Granite, Marble, quartzite Slabs are available in a large variety of colors and patterns. We import our granite and marble directly from the quarry and hand selects the finest quality. We perform all types of works in marble and granite, the best quality and everything to your requirements. At RELIABLE GRANITE, we can help you all along the way, from start to finish , in the planning, design and completion of your project. Our knowledgeable and friendly staff are more than happy to assist you and answer your question. 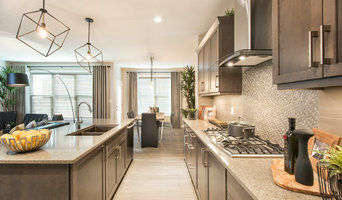 Whether you are just looking to update your kitchen with a fresh new look, or you are ready to re-design your space into something more functional, we will make your design dreams a reality! 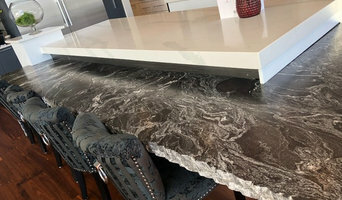 K&J’s Custom Granite of Edmonton transforms huge slabs of stones into beautiful kitchen countertops, bathroom vanities, bartops and fireplaces. We want you to have the décor that’s right for you. That’s why we educate our customers on the different kinds of stones and their pros and cons, before you make a product choice. Our in-house designers help customize your design so that your home is personalized to your needs. Whether it is your kitchen, bathroom or any other space, our assortment of granite, marble and quartz products give you style and convenience. 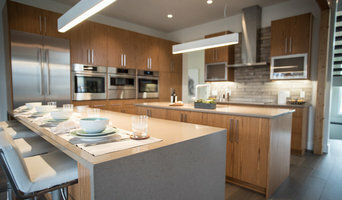 PF Custom Countertops has been a trusted countertop manufacturer in Edmonton since 1969. Granite, quartz, laminate, and solid surfaces are our specialties. Whatever your project’s size or complexity, we offer you quality workmanship, products, and service. We deliver on our commitment to quality by building experience within our team. We invest in and value our people; this enables them to develop the knowledge and skills required to provide custom countertops and ensure complete accuracy. Our approximately 80 staff members, many of who have been with us for years, know what they’re doing and are always ready to answer questions and dream up solutions. We share one goal: to give you the countertop you want, while respecting your budget, accommodating your schedule, and meeting our own high standards. You can trust us to address every aspect of your project from start to finish. As well, we guarantee our workmanship and extend a one-year warranty on installation. Visit our showroom today to see what’s possible. At Fine Lines Tile & Stone, we have a team of stone artisans and technicians that specialize in detailed fabrication and precise installation of granite, marble, quartz, travertine & slate. We welcome all retail and commercial customers, including builders, contractors, interior designers and architects. Our specialties include kitchen countertops, bathroom vanities , shower and tub surrounds, , fireplaces,and wet bars Commercial applications include, , reception areas/workspace countertops, wall art, hospitality, hotels, urban housing projects and office building installations. We offer in home consultation and have an Interior Designer on staff. 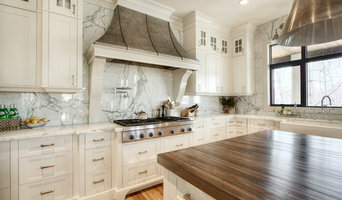 Damato Granite & Marble inc.
Damato Granite & Marble is a leading fabricator of countertops, fireplaces and showers crafted from enduring granite, marble and quartz. Our reputation is built on a solid commitment to excellent craftsmanship, service and installation. We strongly believe that personal referral is the ultimate marketing tool. A happy customer will always share and recommend our services to other people. For this reason, we strive hard to provide you best in terms of design and performance. Established in 1978 Julian Ceramic Tile Inc. has grown to be one of the top Tile Wholesale-Distributors in Western Canada and Western USA, employing over 80 people. Our mission is to build on our history of product excellence, tile innovation and dedication to provide the highest quality products. We strive to be the Industry Standard in service to our customers and are committed to integrity in business. Julian Tile Edmonton is here to help you with your tile, WEDI Shower Systems and setting material needs. Come visit us! What does a tile, stone, and countertop professional in Edmonton, AB do? Any professional involved with countertops, stone or tile work during the construction or renovation is a tiling professional. Most Edmonton, AB tile experts have a comprehensive understanding of which surfaces will work best in various locations within the home. Tilers and Edmonton, AB tile manufacturers will have a great range of tile designs, sizes and materials to choose from and will help you to pick the best tile based on your tastes and requirements. Also, ensure you hire a tiler to lay the tiles out neatly and evenly. Don’t forget Edmonton, AB tile professionals can also install murals and mosaics, as well as add decorative edge treatments around the house. Why should I hire a professional a tiler or installer in Edmonton, AB? Perfectly laid tiles and countertops can look simple and seamless once finished, but installing them is far harder than it looks. It really pays off to consult an Edmonton, AB tile shop or hire a professional tiler in Edmonton, AB as they will have the experience and expertise to finish the job efficiently, quickly and to a high quality. Tilers or the tile showroom will also repair or replace surfaces in the event of chips, cracks, stains or other damage. Many tile, stone, and countertop professionals in Edmonton, AB also install shower pans, flooring systems and other common components of surfacing jobs. Do you manufacture the tiles or source it from elsewhere? Are the workers' employees or subcontractors? Narrow your search in the Find Pros section of the website to tile, stone and countertops in Edmonton, AB. You can also look through photos to find tile, stone and countertop projects you like, then contact the contractor who worked on it.